WCA’s Marquan Watson, left, and Sacred Heart’s Jamaal Watson start the second NVL semi, a win by the Hearts. WATERBURY — No. 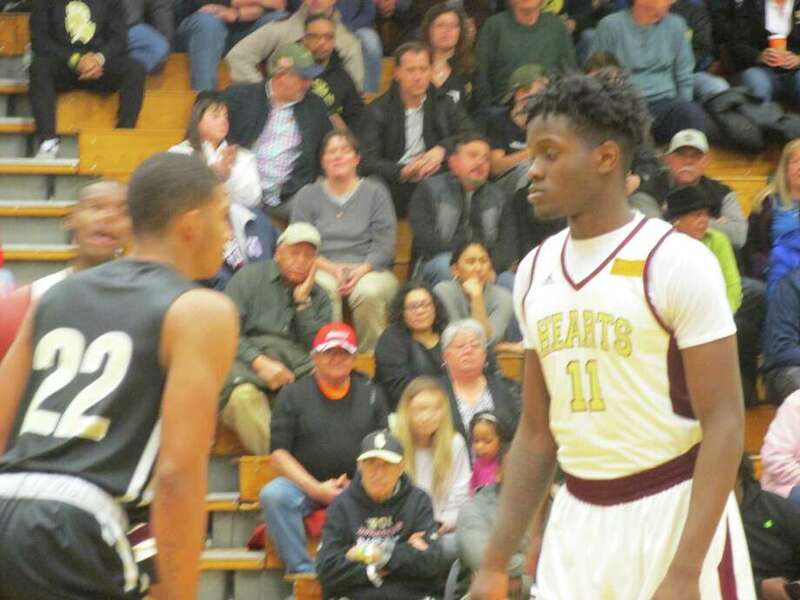 3 seed Torrington and top-seeded Sacred Heart will meet at Wilby High School Wednesday night at 7 p.m. for the NVL boys basketball tournament championship game if an impending storm allows it. Monday night, each team created its own storm at Wilby — Torrington, by shooting the lights out on No. 7 Crosby, 95-83; the Hearts with suffocating defense in an 80-55 stampede over WCA. “We just played well,” said Torrington coach Eric Gamari, whose team lost a close regular-season game to Crosby on a night when the Bulldogs buried 13 3-pointers. Monday was Torrington’s turn to hit 13 3-pointers as the Red Raiders came out on fire and blazed away all game. “(Tyreek Davis) had the best game he’s played (35 points, including 5 threes), and we got contributions from everyone tonight,” Gamari said. That notably included Joel Villanueva, battling inside and out for 19 points. C.J. Root came off the bench for five 3s and Dontae Thomas, in the thick of the fast-paced action, scored 13. While Crosby’s Kerwin Prince was doing a star turn with a game-high 42 points, joined by Tyler Spears at 26, Torrington’s Davis led the Raiders on a mission all night, beginning with a 25-20 first-quarter edge swelling to 52-38 at the half and 82-62 after a 30-21 third quarter that cushioned Crosby’s comeback attempts in the final period. In the late game, there was no coming back for the Spartans, despite a relatively close game between the two teams at the end of last month. WCA’s Marquan Watson lit up the scoreboard with 33 points, along with Lawrence Lazaro’s 14. Hearts Nate Tabor (26 points) and Jamaal Waters (24) countered on offense while the Hearts had most of the other Spartans contained on defense. Kerwin Prince 15-12-42; Tyler Spears 4-0-9; Justin Davis 10-1-26; Jordan Santos 2-0-6; Totals: 31-13-83. Dontae Thomas 6-0-13; Tyreek Davis 14-2-35; Joel Villanueva 8-2-19; C.J. Root 5-0-15; Kevin Dixon 1-0-2; Ben Smith 1-0-2; Nick Balducci 1-0-3; Matt Rylander 2-0-4; Brian Ballesteros 1-0-2; Totals: 39-4-95. 3-point goals: C — Spears; Davis 5; Santos 2. T — Thomas; Davis 5; Villanueva; Root 5; Balducci. Records: Crosby 14-8; 13-7 NVL. Torrington 17-5; 16-4 NVL. Marquan Watson 12-8-33; Langston Racine 0-2-2; Zion Lott 0-1-1; Lawrence Lazaro 5-1-14; Jaden Stallworth 1-0-3; Gerald Counccil 1-0-2; Totals: 20-12-55. Nate Tabor 10-1-26; Omar Rowe 4-0-9; Connor Tierney 2-2-6; Caleb Sampson 1-1-3; Jamaal Waters 11-1-24; Lorenzo Washington 1-0-2; Trevon Duncan 3-0-8; Brady Perrotti 1-0-2; Totals: 33-5-80. 3-point goals: WCA — Watson; Lazaro; Stallworth. SH — Tabor 5; Rowe; Waters; Duncan 2. Records: WCA 13-9; 13-7 NVL. Sacred Heart 21-1; 20-0 NVL.